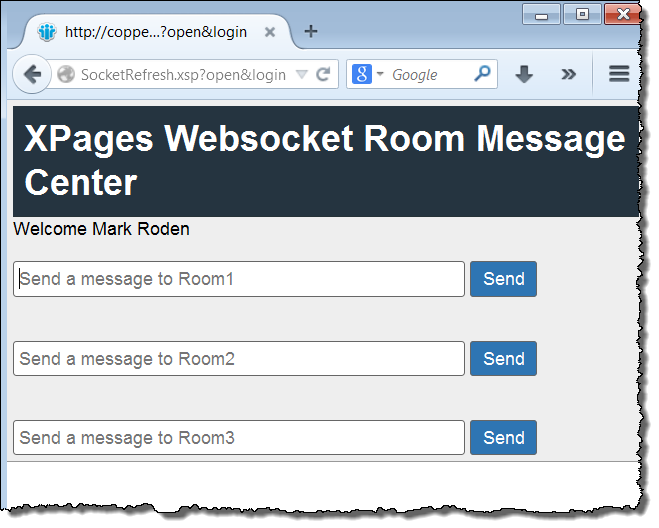 In this article I will demonstrate how the use of socket.io “rooms” enables us to send message to users who are only accessing specific pages within our application, rather than blanket messages to all users. In the previous article I demonstrated how to use a message POST to the node.js server which could then be turned into a chat message and sent out to all users. While this is a nice example it only serves as such and does not have significant business value. In this article I will begin the peel back the potential for much greater application flexibility through the controlled use of targeted Websockets messages to users of an application. Most applications have more than one “page” within it and we may wish to send a message to users of one page rather than all pages. Conversely we may want to only send messages to users who are viewing certain types of information wherever they are within the application. In this article we are still going to use the chat example but this will be the last time we use “chat” as the use case. 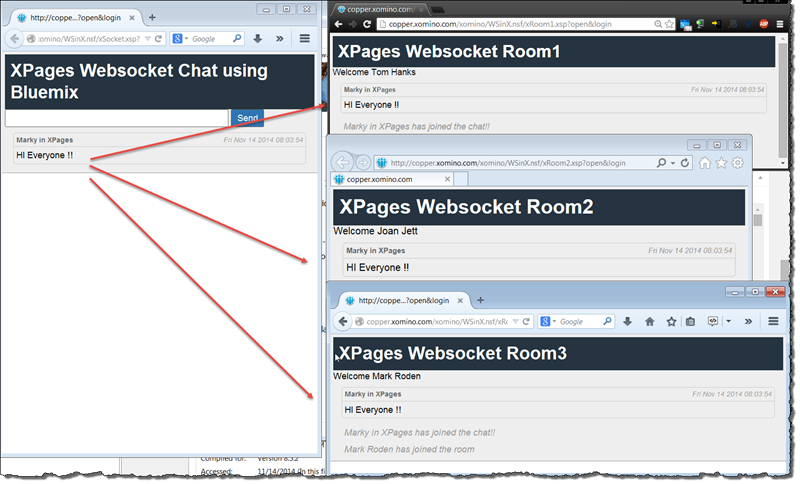 In future articles I will look into more practical applications of Websockets messaging within an application. Looking at the socket.io documentation for rooms and namespaces you can see that the API exposes the ability to create individual communication channels between the server and the application users. When the “joinRoom” event is registered on the server then the socket is joined to the room name which is passed in. A message is the broadcast specifically out to all the existing room members that the new user has joined. Note that this message is room specific because of the io.sockets.in(room) rather than a blanket message to all users. Modifying the original POST code which was shown in the previous article I was then able to create an XPage which will send a targetted message to a specific room. To do this, all I had to do was pass in an additional POST parameter of the room I wanted to send a message to. I create a new Master XPage which had 3 fields on it – one for each room. Each of the individual fields had a “room” attribute which allows me to pick up a value to specify which room to send it to. The best way to see all this is to see it in action – as you can see from the video below. marky.psclistens.com is the same local server as copper.xomino.com (I use a hosts file to make them both look at localhost). But this allows me to play with cors and in this case talk to the local or bluemix node server without needing another “Domino” server. Because the site running locally is already connected to the Jazz Hub Git repository, as with the previous examples all I have to do is commit the changes locally, push to the Jazz Hub repository, the application will then be re-built and re-deployed to Bluemix. It’s really about as simple as that. Because the code is already primed to check to see if we are looking locally or at Bluemix, a new URL for the application now looks at Bluemix. So why do we need Bluemix again? While the development was performed locally, the intention is to be able to create a capability which does not require the user to have a locally running node.js server. That is where Bluemix comes in. In essence what we are creating is a cloud hosted Websockets service which can be integrated into existing applications. In this article we have seen that with a little creativity we are able to register different chat rooms within the same application. There are other ways to do this of course but the point of this example was to demonstrate the ability to send a specific message to specific users looking at an individual XPage. In the next article we will take a look at the practical implications of this within an XPages application. Similar to Eclipse, Webstorm has a local history capability, allowing the developer who realizes they made an idiot mistake an hour ago, to go back to it and save their day. We’ve all been there and while committing to source control is a must for modern development, there are those times in between commits and then those when you are just too lazy to go through the repo looking for it. Local History is always enabled in Webstorm – for the official help check here. This will then show you not only the local history between saves – but also the Source Control Commits – sweeeet ! 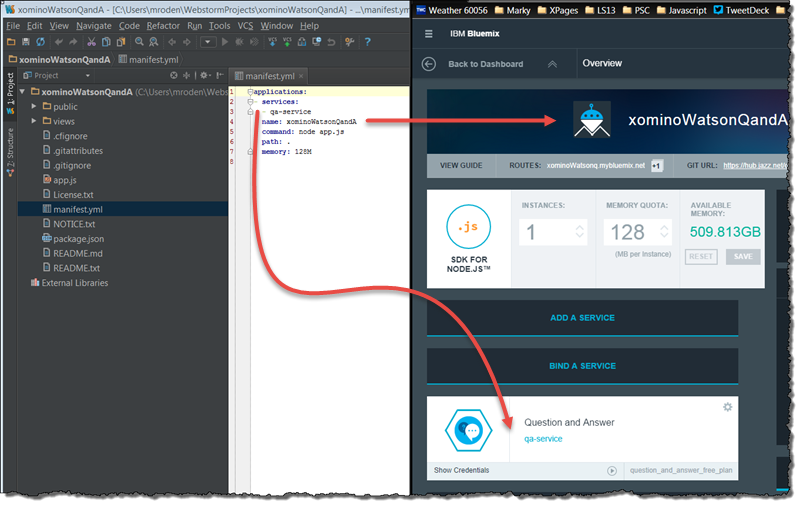 In this article I will demonstrate how to get up and running with one of the Bluemix/Watson service examples. I will be using the example provided by IBM in their documentation as the basis for the article but the way in which I achieved the final goal was quite different from the way that they explained it in the example. I could have added BS words as an attention seeking headline, and it would fit because there is so much I want to show in this one post (it is probably should be 5 separate posts). But I figured that it’s probably better to have a more description title about what this is really about (more googlable that way). So be warned this is a longer post than normal because of all the pictures. Going through this experience helped me better understand Git, Webstorm (and how it uses Git), Jazz Hub and Bluemix. 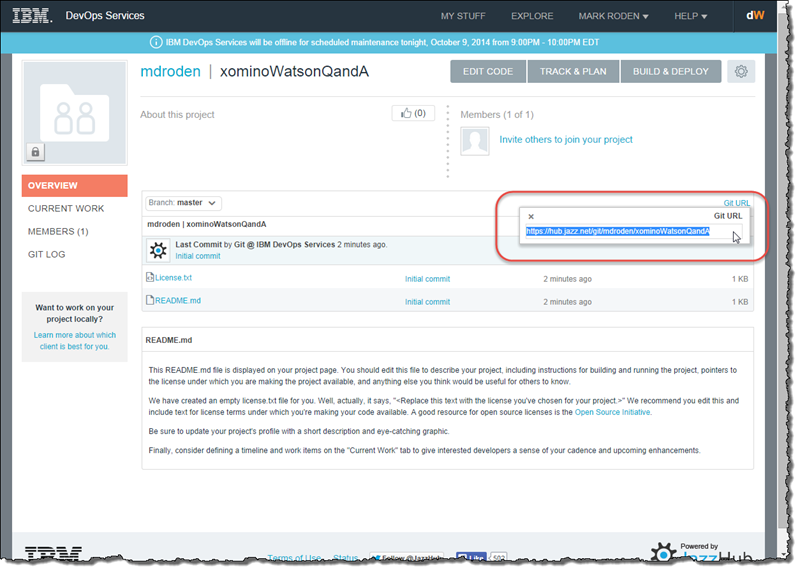 Creating an example of using the Bluemix Watson service. Earlier this week IBM announced that they added the Watson API as a service to Bluemix. I honestly have no idea what I would ever use this for in my line of business but the coolness factor is huge! In this post I am going to demonstrate how I was able to create the example service without using the same process as laid out in the IBM documented example. As this is a long post (lots of pictures) I will be discussing the separate parts in other posts. 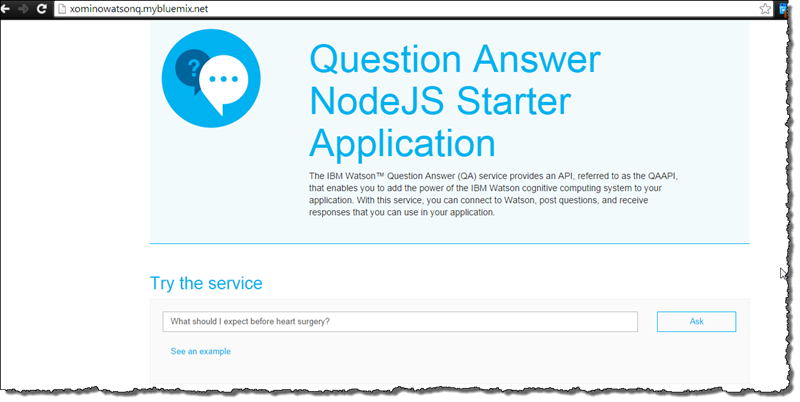 There are also other ways of creating your App from scratch (for example Create an App, select node.js as a runtime and then bind the Watson service.) The reason I did the example this way was to highlight that you do not always have to start with a new service. I needed a node.js runtime, and it happened that one of my services already provided that (the DataCache starter service). That’s kinda cool and kinda the point of Bluemix! Your should be presented with your dashboard. Now we have the pieces necessary to build the application on. 8) Confirm existing service code? The next prompt asks me if I want to create starter code in the new Git Source Control repository. In this case I do not – un-check it. Click on the Jazz Hub URL displayed on the right hand side. The Add Git link will be replaced with a link to the repository. Click on the link to go to there. We will look at Edit Code in another post. In the picture below you can see over on the right there is a link for the Git URL – click on that and copy the URL. As I was working my way through this example I wanted to learn more about how Webstorm functions as a Git client. You can use Source Tree or the Git command line if you prefer. 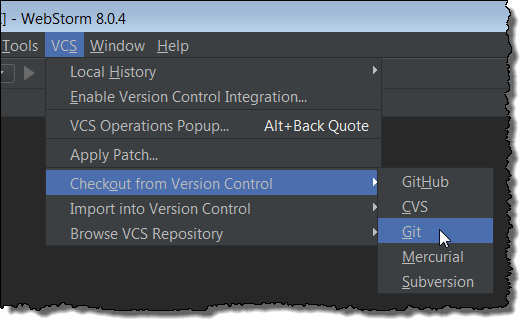 You need to ensure that Git is enabled in Webstorm before you proceed. it is not configured out of the box. 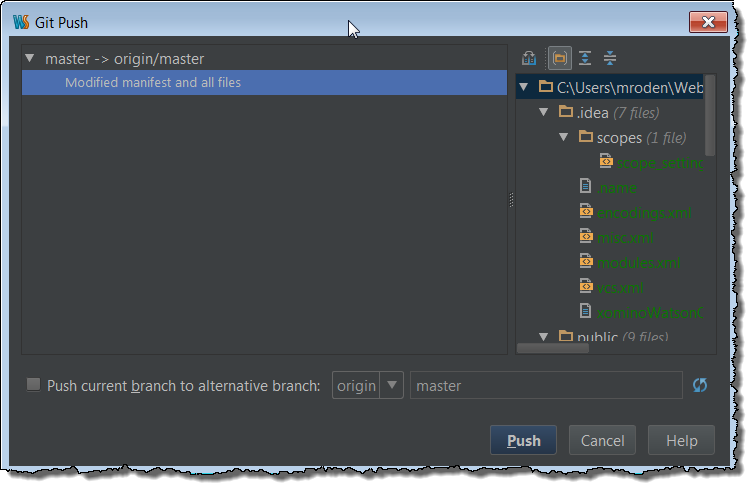 The instructions for enabling git are found here https://www.jetbrains.com/webstorm/webhelp/using-git-integration.html. You will need to have Git installed before hand. Follow the ssh key instructions and it will show you how. Following the example site, download the sample file qa-nodejs-sample.zip. 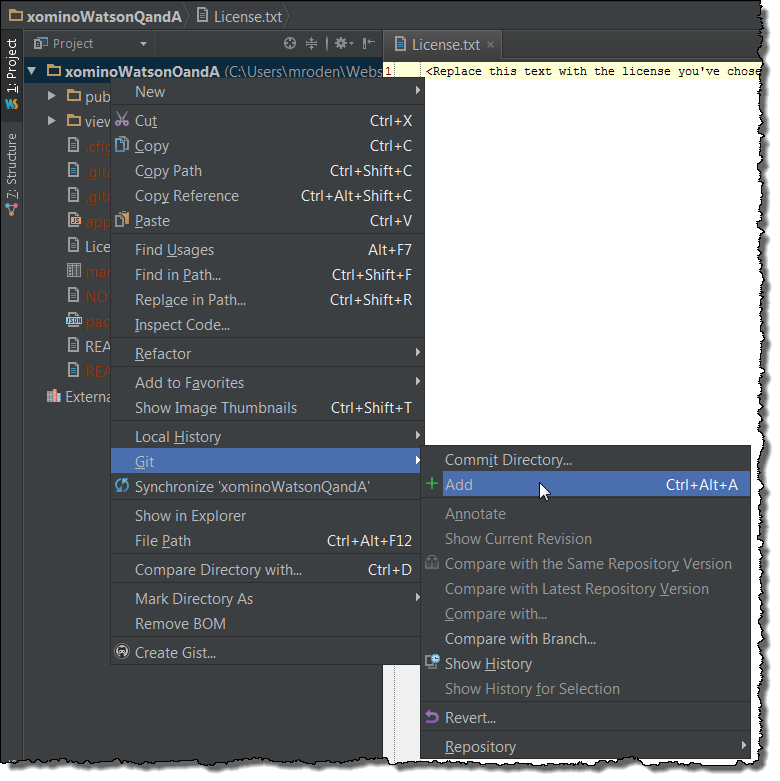 Unzip it locally and drag the files into the repository directory created by Webstorm in the previous step. Clicking back into Webstorm you will see the files refresh in the project – they all appear “red” because although the files are in the repository directory they are not current added to the Git configuration, it does not know they exist. Right click on the project and add the directory as follows. 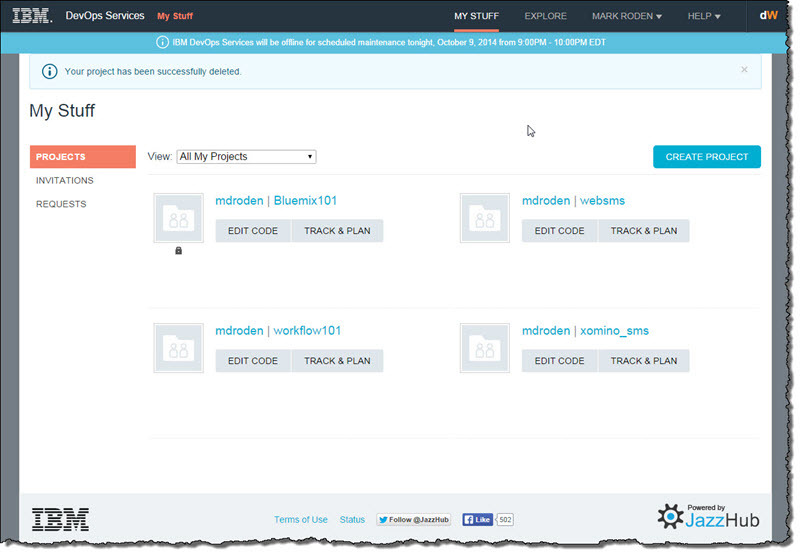 Within Bluemix the manifest,yml file is the key to holding everything together. It contains the “services” and the application they are used in. 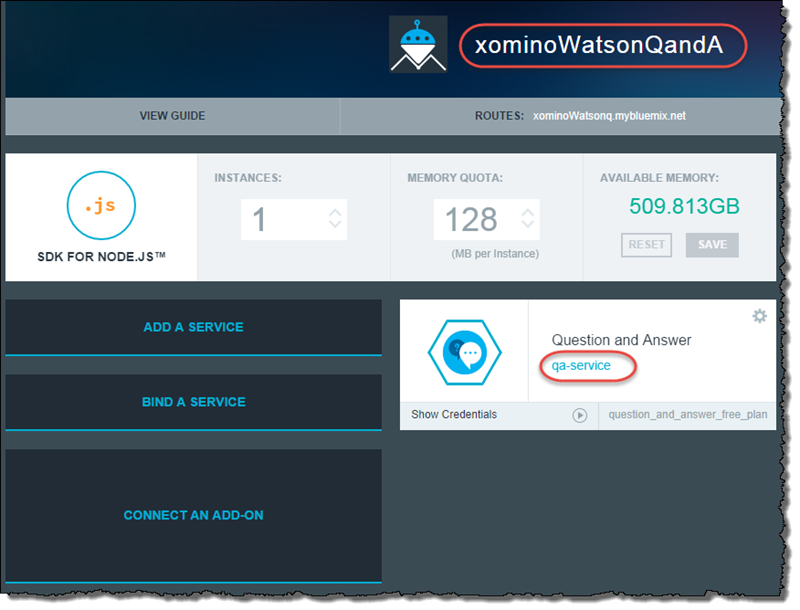 In my case the service name for Watson was qa-service and the application is xominoWatsonQandA. You can also see from the manifest file command “node app.js“. If you look into the other files currently in the example you will find app.js. 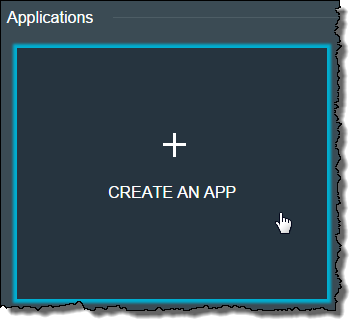 This tells Bluemix how to start the application. 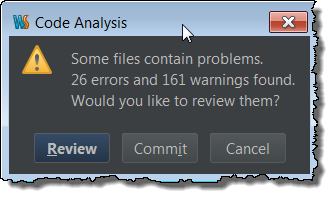 And then Webstorm tells you that you are stupid!! You can now see by refreshing your Jazz Hub page that all the files are now in the server repository. 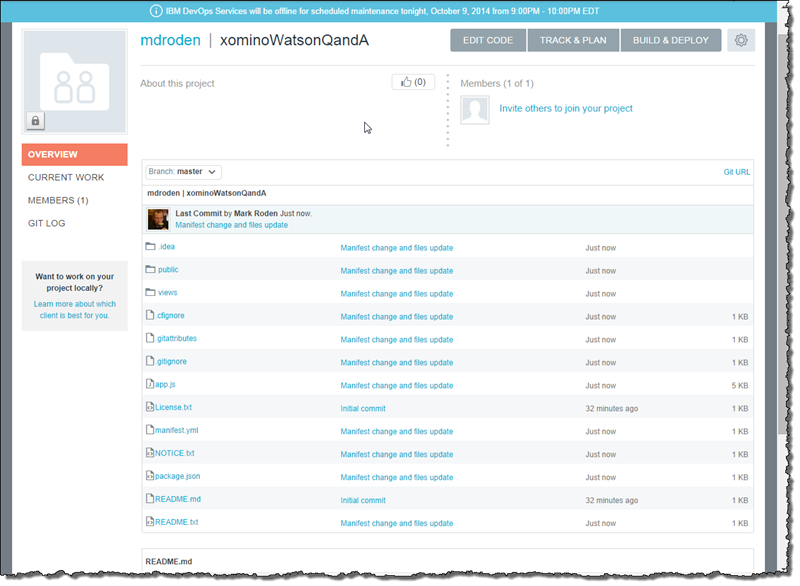 You can also see next to my picture in the middle “Manifest change and all files” as the last commit comment. Then comes the really cool and completely not Command Line experience. 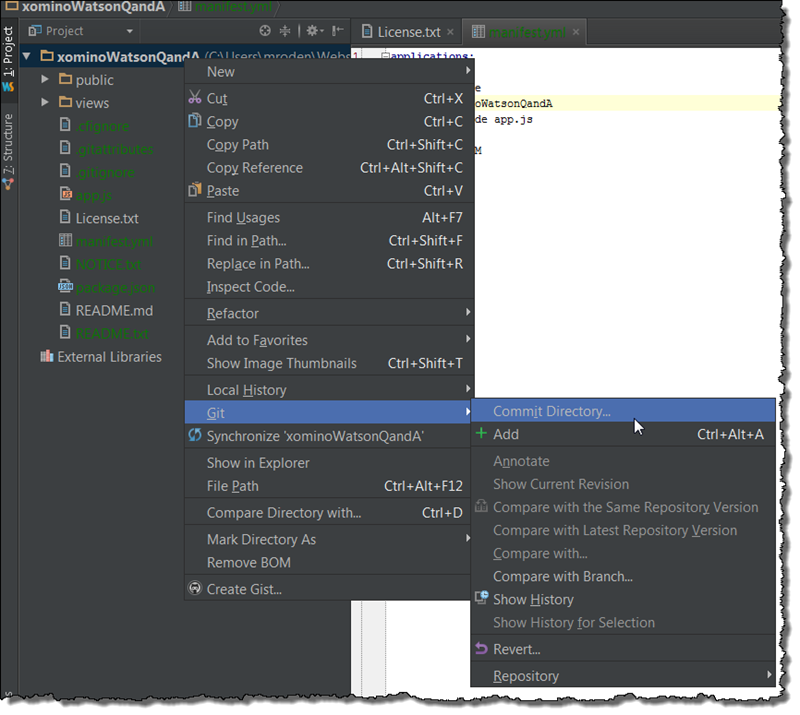 In the top right of the page you can see Build and Deploy…. You will be taken to a page where you can see the results of the build and deploy. Jazz Hub is very smart and self aware. 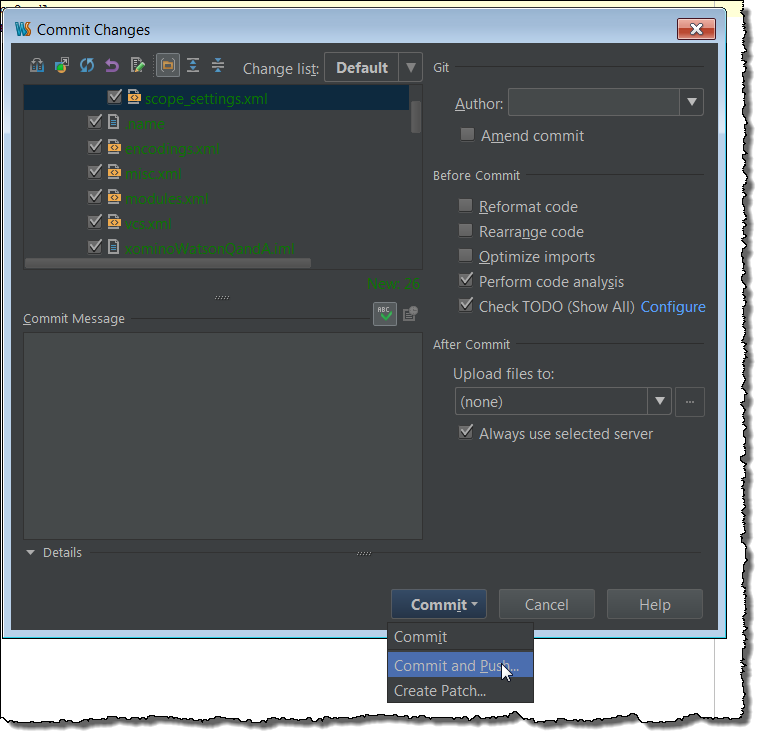 If you have un-committed changes within your repository it will not let you Deploy. That is for another day though. 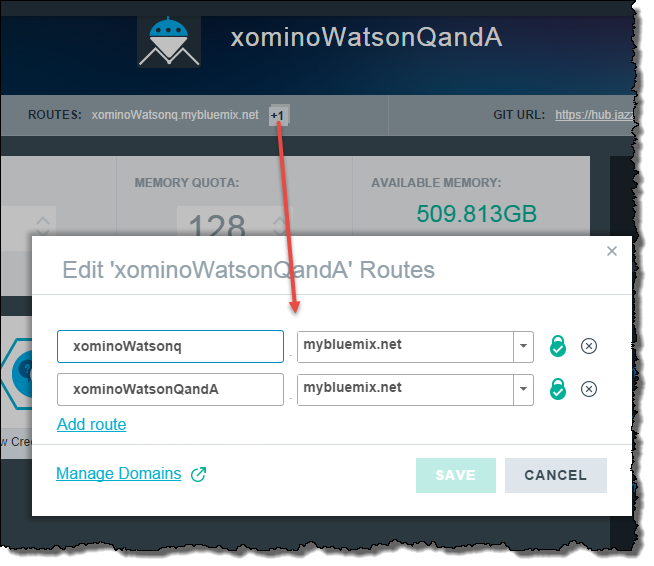 Note: what’s interesting is that the Deploy to URL which I cannot change is xominoWatsonQandA.mybluemix.net not what I would expect as xominoWatsonQ.mybluemix.net which is the route I gave the application in the first place. Turns out I not have two routes to the same App. I can see this back on my bluemix dashboard as there is now a (+1) next to my routes options! So note to self, name your route the same as the application name! In this example we saw a LOT of cool new features, concepts and ideas for Domino developers and you know that we have barely scratched the Bluemix, Webstorm, Jazz Hub surface. I learned a significant amount of new and cool things from going through this process. The first time from scratch it took about 90 minutes to figure out what I was doing. The second time I went through it, even taking all the screenshots for the blog it took 25 minutes. We only changed two lines in one file to make this work – anyone can do this !! Like I said at the top of the article, I have no idea how I would use Watson in the day job but that was not the purpose for doing this example. These “services” are componentized capabilities which we can take advantage of. Imagine the growth possibilities as more and more services are added to Bluemix. This has got to be fun to watch and follow along. Remember IBM are investigating putting Domino into Bluemix. I am no expert on Java development using DDE but from what I have picked up there are others who are doing their pure java development outside of DDE and then importing it into DDE to run in their applications. For power-developers stability and speed are just as critical as flexibility and practicality. There are a number of tools currently en vogue for web developers. SublimeText is a very powerful text editor and Github have release a new “Atom” editor which is getting a lot of press right now as well. I am going to use JetBrains Webstorm for these articles. 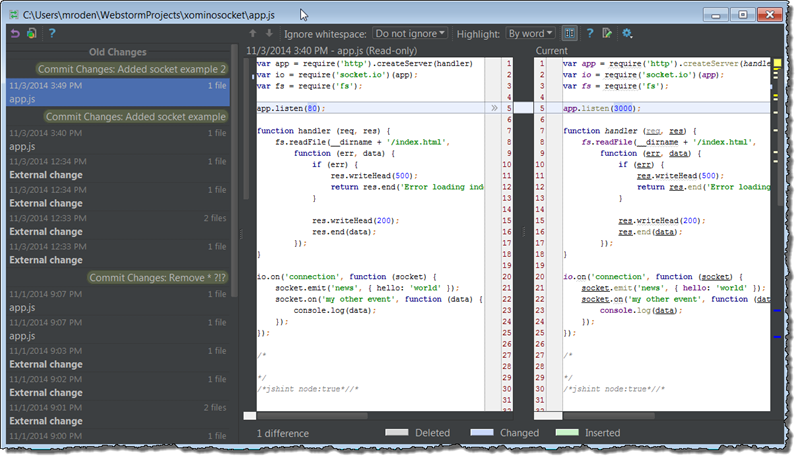 Webstorm is a great IDE and comes with a bonus of having Angular integration built in. Why not use DDE and XPages? Seems simple enough but we really should use the right tool for the right job. This is particularly important when we start to look at Angular directives which rely (when not using the HTML5 standards) on the single word attribute in the HTML element. Secondly, as you will see from the examples in the upcoming articles I will be creating HTML pages not XSP pages. These can still reside inside of the database but are not “XPages”. I will not be using XPages “controls” and in fact not using Dojo either. So there is no benefit to using DDE at all in this case for my front end development. I will be using DDE to create REST services (maybe) and I would use DDE to create Java code to supply data to the user. Finally – Eclipse is a large tool and is frankly slower than me. It’s a frustrating when I constantly have to find something to do while a database waits to open, checks mail, Builds something, crashes in a corner quietly. I won’t miss using it. Even if we are not working with a Domino server, we still need to be able to review and test what we are working on. 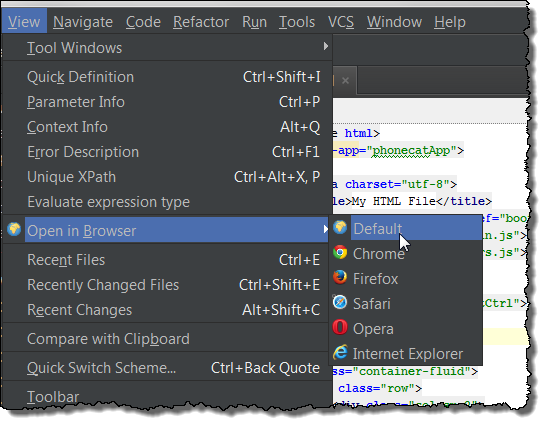 In Webstorm you can preview your code as Webstorm generates it’s own local basic web server. The web server is configurable and as we will come to see it will help us in our Domino development environment as well. One really nice feature about the debugger is that it allows Live editing, so you can edit and build you code and watch in real time as the code is updated on the screen. This is very cool when you are building out your HTML templates. I this case on a large monitor I have the IDE on the left and the browser on the right. You can see this technique in action on the http://egghead.io angular tutorials. Even in the short time I have been using Webstorm I have found it to be an exceptionally quick development environment compared to DDE. DDE certainly has its place but even if I am not using angular for future projects I am seriously going to consider doing as much of my development using Webstorm rather than DDE. Tooling is a very personal thing for a developer, in this case when I am approaching the project from a Web Development perspective and creating web pages without the overhead of the JSF lifecycle, there really is no need to use DDE to build these examples. I am going to use XPages for data sourcing and CRUD. I do not want this to become a discussion of whether this approach or not this is right or wrong and I encourage everyone to consider their comments before posting. The point of this series is for education and mind broadening, driven by my own selfish desire to learn and broaden my mind. 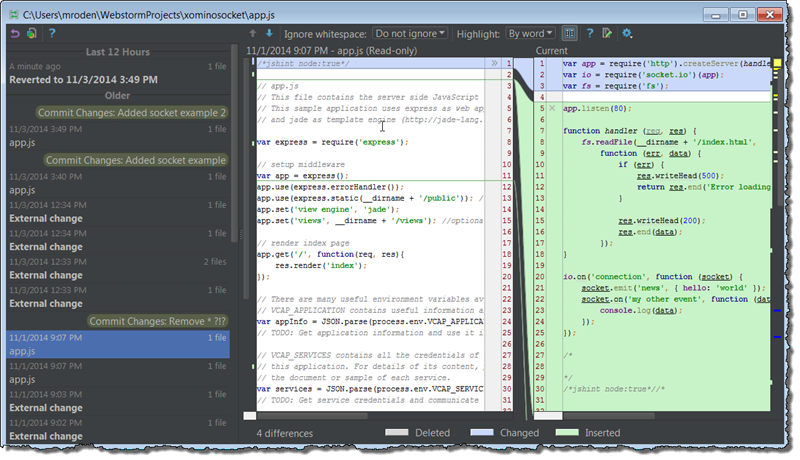 Just so you know Jetbrains also make a Java IDE which is used for android development – http://www.jetbrains.com/idea/ – another alternate to eclipse. Again it isn’t free, but may be worth checking out because free doesn’t mean the best (and visa versa).